The Pūhoi to Warkworth project will extend the four-lane Northern Motorway (SH1) 18.5km from the Johnstone’s Hill Tunnels to just north of Warkworth. It is the first stage of the Ara Tūhono – Pūhoi to Wellsford Road of National Significance (RoNS). The extension is due to be open for traffic by late 2021. Geotech have been contracted to conduct all major earthworks as part of this project. Work is spread over three major work areas. The damage caused by the 7.8 magnitude November 2016 Kaikoura earthquake to the Main North Line (MNL) railway (and SH1 along the east coast of the South Island) was unprecedented in New Zealand. There were 60 major damage sites along the MNL, including tunnels, bridges and embankments. 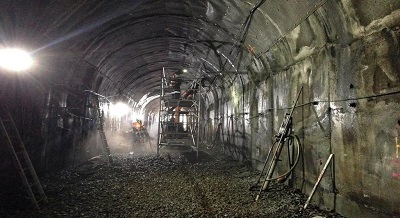 Geotech have had two tunnel crews and support staff providing tunnel remediation services. 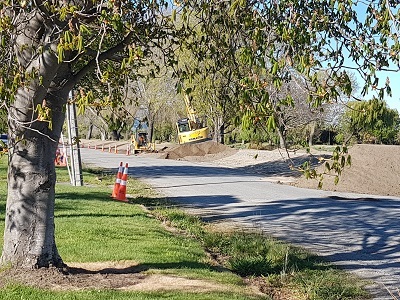 Geotech were engaged by the North Canterbury Transport Infrastructure Recovery(NCTIR)to assist with restoring road access to Kaikoura after the 7.8 magnitude earthquake in November 2016. 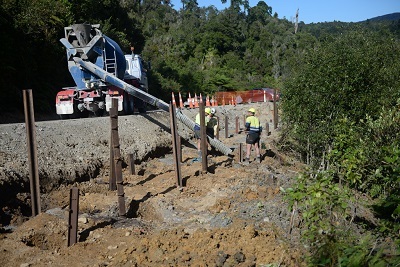 Geotech staff have been working on sections of the narrow coastal corridor of SH1 south of Kaikoura, with additional crews working north of Kaikoura. Works have predominantly been made up of clearing landslides. Work is not straightforward due to the fractured cliff faces being unstable. Damaged slopes continue to release rock and material, and weather events and continuing seismic activity have presented ongoing challenges throughout the contract, including additional land and mud slides during bad weather events. 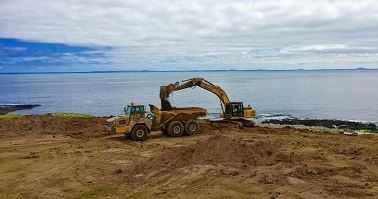 Geotech were contracted to establish and operate a quarry on the Chatham Islands. The quarry was required to provide concrete aggregate for the Chatham Islands Wharf upgrade. The project required construction of a decant pond, establishment of a 26,000m2 quarry, establishment of a site office, construction of access roads, stockpile areas for overburden and material, quarry blasting, general quarry management, explosives management and design of rehabilitation. 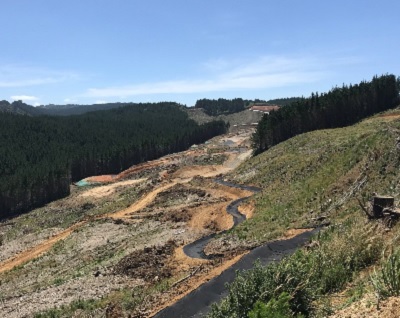 Geotech were engaged as a subcontractor to complete slope stabilisation work below the State Highway to repair embankment slips and a substantial drop out, resulting from a severe weather event. A filled embankment (around 11m in height) was constructed using a terramesh system and geofabrics to bring the level back up to the road pavement level at the drop out site. Terrain was steep at the site, and access was difficult. 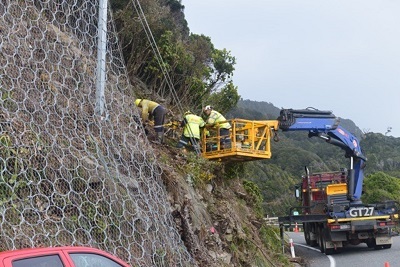 Geotech were engaged to install a hybrid catch fence to protect SH6 traffic from rockfall risk. The contracted works supplied included rockscaling and vegetation removal, drilling, grouting and testing, hybrid catch fence installation, traffic control, site rehabilitation, tidy up and demobilisation. 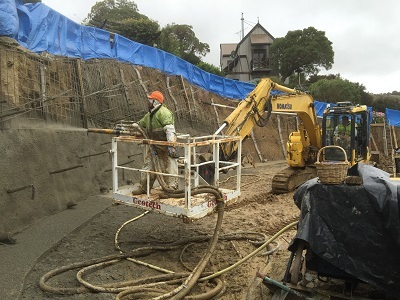 Geotech were awarded the tender to construct a shotcrete and soil nail retaining wall structure above State Highway 75 between Duvauchelle and Robinson’s Bay. The contracted works supplied included,construction of access to the work area and vegetation clearance; Excavation of a working platform; Construction of a shotcrete and soil nail retaining wall; Carpentry works, including construction of wooden stairs and hand rails; Installation of elevated stormwater and sewage pipe lines suspended from the wall face; Landscaping; Compaction of soils; Site rehabilitation, tidy up and demobilisation. 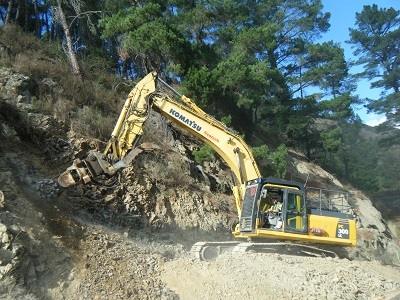 Geotech were engaged as a subcontractor to undertake rock removal at SH7A, Ferry Cutting. The rock to be removed was overhanging the road and falling, creating a dangerous hazard that could not be removed conventionally. The site was just past a narrow bridge, on a two lane stretch of road, with embankments on each side. A minimum of road closure disruption was required by the client, as the road leads into a high profile tourist town (Hanmer Springs). Geotech proposed a methodology utilising mass blocks to assist with ramping an excavator up to the required height, and milling the rock using an Erkat milling head. The option offered a high level of precision without the risk of additional damage to an existing poor rock mass that was actively failing. It also meant that staff were protected from any rockfall risk, and single lane access for traffic was able to be maintained for the majority of the contract works. 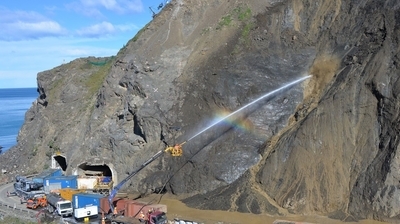 Geotech ran Strongman Mine on behalf of Solid Energy New Zealand based around a methodology of how to gain additional resource from the depleted and finished mine, this was done by using precision blasting to steepen up pit highwalls enabling extraction of the exposed coal. 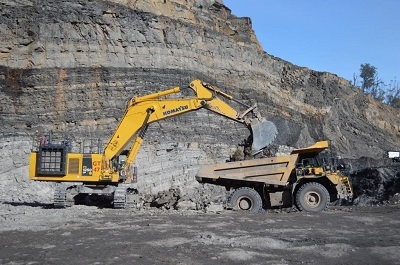 Geotech was responsible for funding, fleet configuration and maintenance, mine planning, resource assessment and extraction/production planning, that was completed over five years with 34 fulltime staff on site.